The Blue Ridge Parkway winds for 469 miles along the spine of the southern Appalachians, connecting Shenandoah National Park in Virginia with the Great Smoky Mountains National Park on the North Carolina/Tennessee border. 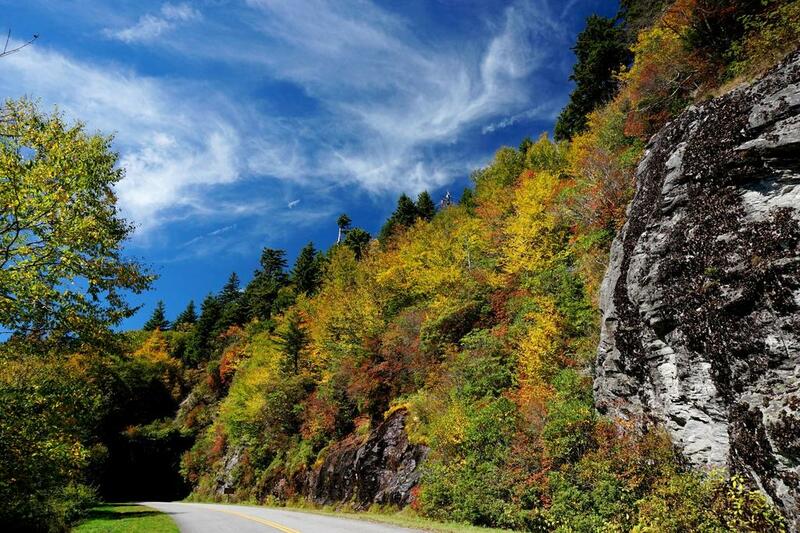 View at the Devil's Courthouse tunnel, on the Blue Ridge Parkway south of Asheville, NC in fall color. Under the auspices of the National Park Service, the Parkway provides many great hiking opportunities along its length. Trails to soaring peaks, or plunging waterfalls - take your pick! Want a flat, easy loop through tall trees? Or a steep, rugged trail through mountain meadows? They're both waiting along the Blue Ridge Parkway. Since the Blue Ridge Parkway spans over 250 miles within North Carolina, we have divided it into six sections about 40 to 50 miles in length to be used as Trailhead areas on this site. Though the cut-off points are somewhat arbitrary, they were envisioned such that you should have enough time to drive on the Parkway from one end of a section to the other, complete a hike or two, and return, all within a reasonable day trip. Virginia State Line (MP 217) to NC Hwy. 16 (MP 261). Lies along the edge of the Blue Ridge escarpment, where the high, rolling lands of the Blue Ridge drop off steeply to the Piedmont to the East. NC Hwy. 16 to Beacon Heights (U.S. Hwy. 221, MP 305). Continuing along the Blue Ridge Escarpment, the parkway begins to pass some of the larger mountains such as Grandfather Mountain, the highest peak in the Blue Ridge. U.S. Hwy. 221 (Beacon Heights) to Mount Mitchell State Park (MP 355). Leaving the Blue Ridge, the parkway in this section heads West into the Black Mountains, which includes Mount Mitchell - the highest mountain east of the Mississippi. Just past Mount Mitchell State Park to Asheville (MP 394). Travels along the Black Mountains - the highest in the East - and the Great Craggy Mountains before descending to Asheville in the French Broad River Valley. Just past Asheville to NC 215 (MP 425). Travels up from Asheville to the crest of the Pisgah Ridge, and around Mount Pisgah, a prominent peak in this range. Trails connect with those on Pisgah National Forest land in the Pisgah Ranger District. Just past NC 215 to the end at Great Smoky Mountains National Park (MP 469). Travels through the Great Balsam Mountains and the Plott Balsams before ending in the Great Smoky Mountains National Park.